BERKELEY, CA  A team of scientists from Lawrence Berkeley National Laboratory and the Scripps Research Institute has determined the crystal structure and molecular mechanisms of a key part of WRN, a protein that protects humans from premature aging and cancer. 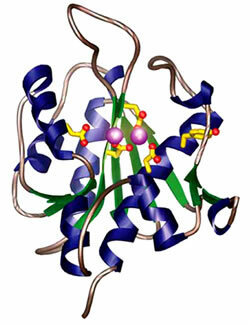 The fold structure of the WRN exonuclease domain, with alpha helices (blue), beta strands (green), and loops (brown). The active-site amino-acid residues are at center (yellow), showing oxygen atoms (red) and two manganese ions (magenta). When the gene for WRN is defective the result is Werner's syndrome, a rare inherited disease that shows no symptoms until puberty but soon causes rapid aging. Beginning in their twenties, victims may become afflicted with cataracts, hair loss, wrinkled skin, osteoporosis, arteriosclerosis, and type II diabetes; many patients contract cancer, and most die by the age of 50. Understanding how the WRN protein normally works to maintain genomic integrity could lead to new forms of treatment for cancer and age-related pathologies. "One reason we are particularly interested in WRN is because Werner's syndrome is unusual among premature-aging diseases, in that children are born normal and show no signs of disease until early adulthood," says Steven Yannone of Berkeley Lab's Life Sciences Division. "This gives us a better chance of clearly separating defects in development from aging." "We wanted to study the protein itself because it is unique," says Jeff Perry of the Scripps Research Institute's Department of Molecular Biology and Skaggs Institute for Chemical Biology, formerly of Berkeley Lab, who led the research with Yannone. "WRN belongs to a family of enzymes called RecQ helicases"  of which there are five in the human genome, performing important functions in DNA replication, recombination, and repair  "but in this family, only WRN has coupled a helicase function and a nuclease function within the same protein." Helicases open up the double helix of DNA, while nucleases degrade one or both of the DNA chains; both operations are critical to repairing errors and proofreading DNA sequences. One part of WRN is an exonuclease, which starts working from the end of a DNA strand. Perry and Yannone and their colleagues determined the structure of the WRN exonuclease domain (WRN-exo) and showed how the enzyme may function in a series of specific DNA repair events. Their findings will soon appear in Nature Structural & Molecular Biology and are now available online. All the members of the research team were participants in the SBDR program (Structural Cell Biology of DNA Repair Machines) sponsored by the National Cancer Institute. John Tainer, a professor at Scripps Research, member of the Skaggs Institute for Chemical Biology, and a visiting scientist at Berkeley Lab, is SBDR's principal investigator. Co-principal investigator is Priscilla Cooper, head of the Department of Molecular Biology in Berkeley Lab's Life Sciences Division. Tainer says, "The exonuclease domain of the WRN protein is a prime example of what we in SBDR call 'master keys,' structures that open doors to lots of different repair pathways. Among other things, WRN is involved in repairing double-strand breaks, single-strand breaks, replication forks and junctions, even DNA-RNA duplexes. How does one protein know how to interact in so many different processes? If we can understand how this unique protein works, we'll have a key to how all these pathways work in human beings." Cooper says, "Understanding the relationship between the structure of WRN and how it performs its multiple functions to prevent aging and cancer is a perfect example of the kind of problem we designed the SBDR program to solve. With 21 investigators in 15 institutions, SBDR's goal is to gain fundamental insights into the molecular machines that maintain genomic integrity, by applying a range of experimental techniques." Other members of the SBDR team who researched WRN were Lauren Holden and Chiharu Hitomi of Scripps Research, Aroumougame Asaithamby and David Chen of the University of Texas Southwestern Medical Center, and Seungil Han of Pfizer, Inc. Asaithamby, Han, and Chen are former members of Berkeley Lab; Chen is a senior member of the SBDR program. Jeff Perry is a specialist in structural biology, including x‑ray crystallography, and Steve Yannone specializes in biochemistry; both kinds of expertise are essential to solving the mysteries of WRN. The researchers began by constructing, from recombinant DNA, the portion of the protein known to have exonuclease activity. "First we had to find out where the exonuclease region was within the protein sequence," Perry says. The next step was to grow crystals of this exonuclease domain. "Only the last of the 10 crystals we had for phasing  a crucial step in determining structure  worked, so it was a bit of a cliff-hanger." Using x-ray crystallography beamlines 5.0.2 and 8.3.1 at Berkeley Lab's Advanced Light Source, the researchers determined how WRN-exo was folded. The fold structure revealed that WRN-exo belongs to a family of nucleases involved in maintaining genomic integrity, the DnaQ family, which has a long evolutionary history and is found in archaea, bacteria, and viruses, as well as higher plants and animals. Indeed, WRN-exo is the first member of the family whose structure has been determined in humans. The structure of the larger WRN protein is known to be built from several individual copies of WRN. To determine how individual WRN-exo units might work together as a complex, the researchers borrowed a similarly folded DnaQ protein from a plant, Arabidopsis thaliana ("Mouse-ear cress"), and used it as a template for the likely higher-order structure. The result was a ring of six WRN exonuclease domains, just the right size to slip around a DNA helix, with their binding and catalysis sites oriented inward toward the encircled DNA. In this model, six WRN-exo subunits form a ring of just the right diameter to surround a strand of DNA. Active sites of the WRN-exo domains face inward, including the metal ions indicated by spheres. 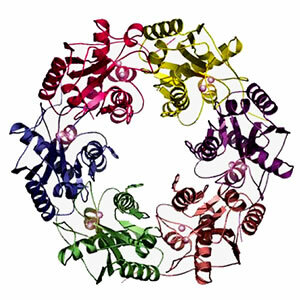 This ring structure reminded the researchers of another protein complex called Ku70/80, which like WRN encircles and binds to the ends of DNA. Also like WRN, Ku70/80 participates in an important form of DNA repair called nonhomologous end-joining; indeed, biochemical assays showed that Ku70/80 greatly stimulates this activity in WRN. Structurally, moreover, the two rings stack neatly together, suggesting that they have evolved to work together. "This is an example of how interesting questions of biochemistry arise from looking at structures," says Yannone. A prominent feature of the WRN-exo fold was the position of the two charged atoms of metal it incorporated. "To compare how different kinds of metal ions affected the activity of WRN-exo, we did both in vitro and in vivo assays," Yannone says. "In the test tube, manganese ions showed higher catalytic activity. But magnesium ions are more common in cells. One or the other is essential if WRN‑exo is to perform its basic function of editing DNA." These and other activity assays provided crucial insights into the relation of structure and function in WRN. In vivo assays were performed with cell lines, including Werner's syndrome cells, supplied by Berkeley Lab's Judith Campisi, a leading researcher in aging. The assays helped to determine just how the WRN-exo domain does its work within the cell, and how mutations in WRN may interfere with that work. Campisi says it's tempting to speculate that differences in the way people age, and how fast they age, could be partly due to variations in their WRN proteins. "Should this be the case, knowing the structure of WRN will be crucial for understanding how slight variations in the protein might alter its function," she says. "Ultimately, scientists might be able to use the structural data to design drugs to specifically optimize WRN function, leading to healthier life spans!" "How does WRN do what it does? When and where does WRN go to work? That's the $10 million question," says Perry, "but we're beginning to answer it." Their approach is to determine the structure and chemistry of individual parts of the WRN protein and then piece them back together. "This will let us clearly visualize just how the nuclease and helicase functions work together," Perry says, "and how they are integrated into cellular pathways through their interactions with partner proteins." Yannone is particularly intrigued by the hope of understanding why the symptoms of Werner's syndrome don't show up until early adulthood, even though WRN is a highly versatile protein that would seem to function at all stages of development. "I suspect that WRN functions in many cellular processes but is essential to only some of them  these unique functions being the key to its role in aging." The structure of WRN exonuclease, itself unique, may be a clue to its selectivity. WRN nuclease is similar to the proofreading domain of the DnaQ family of DNA polymerases, but the nature of WRN's interactions with other key proteins may dictate a more complex, higher-order editing role in maintaining the human genome. "The modularity of WRN-exo is one of the things that's exciting to me," says SBDR's John Tainer. "There are some 30,000 human genes, but the connections among them are not like a wiring diagram  they're more like the way an airline connects its routes, with many pathways going through a few major hubs. WRN is one of those hubs." Priscilla Cooper says, "SBDR investigators and others have shown that WRN interacts directly with a number of other proteins that have been implicated in premature aging disorders, some of which probably constitute other hubs. Ongoing studies of how these hubs connect should yield further insights into the molecular bases of cancer predisposition and premature aging." "WRN exonuclease structure and molecular mechanism imply an editing role in DNA end processing," by J. Jefferson P. Perry, Steven M. Yannone, Lauren G. Holden, Chiharu Hitomi, Aroumougame Asaithamby, Seungil Han, Priscilla K. Cooper, David J. Chen, and John A. Tainer, will appear in a forthcoming issue of Nature Structural & Molecular Biology and is now available online to subscribers. Go to http://dx.doi.org/ and enter DOI number 10.1038/Nsmb1088. The Scripps Research Institute, headquartered in La Jolla, California, is one of the world's largest independent, nonprofit biomedical research organizations. Visit their website at http://www.scripps.edu/e_index.html.